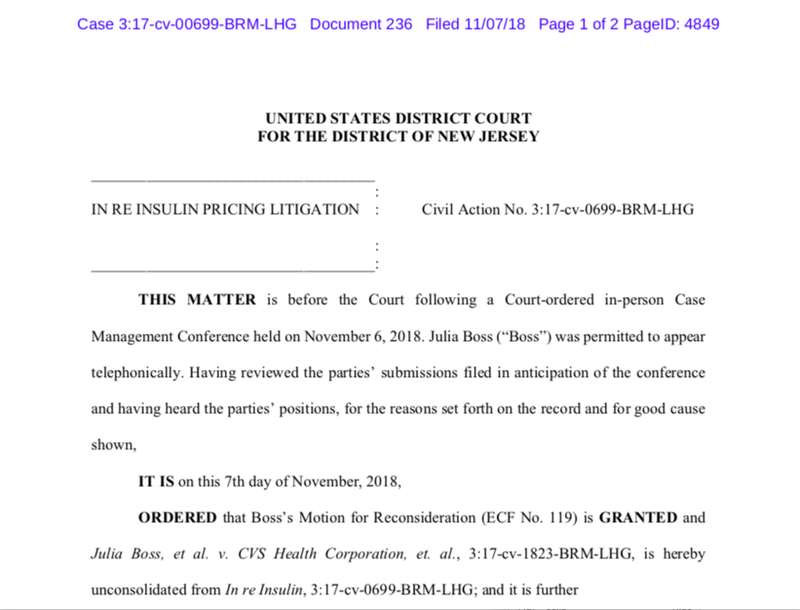 INSULIN LITIGATION UPDATE - At the November 6 case management conference for In re Insulin Pricing, Judge Brian Martinotti ordered “pursuant to the interest of justice” that T1DF’s putative insulin class action, Boss v. CVS Health Corporation (Case No. 3:17-cv-01823) be unconsolidated from In re Insulin Pricing Litigation (3:17-cv–00699)—a consolidated complaint solely focused on insulin manufacturers. Boss v. CVS advances patients’ claims against PBMs, private insurers and public regulators for manufacturer rebate pumping, rebate capture (via plan benefit design) and misrepresentation of plan cost to the insurance-buying public. These claims, stayed by Hagens Berman and Keller Rohrback for over a year, can now go forward independently from and concurrently with the manufacturer-only action. Interim co-lead counsel for In re Insulin Pricing Litigation, Steve Berman and James Cecchi (with the law firms Keller Rohrback; Weitz & Luxenberg; Berman Tabacco; Weil & Chardon; Cafferty Clobes Meriwether & Sprengel; Critchley, Kinum & DeNoia; Fine, Kaplan and Black; Shepherd, Finkelman, Miller & Shah; Criden & Love; Nussbaum Law Group; and Mehri & Skalet) had removed PBM/payer claims and defendants from the insulin plaintiffs’ consolidated complaint filed in December 2017. T1DF intervened in January 2018 on the basis that the intra-class conflict regarding PBM/payer claims should have been addressed by the Court, not by attorneys who have worked to advance the interests of the health insurance industry for over a decade. The Court allowed T1DF’s president Julia Boss, as an individual pro se plaintiff, to file a motion for reconsideration of the consolidation order in March 2018. In that motion and a subsequent supporting motion, Boss argued that users of insulin urgently need to address the injuries caused by insurer rebate capture. Manufacturers pay large rebates to insurers, directly to the insurer’s national holding company or to health plans via PBMs, based on individual plan members’ use of insulin. Yet insurers mislead health plan members regarding plan cost. Instead of basing cost sharing on the actual net cost to plan, insurers/plans direct some patients to pay based on artificially inflated gross claims expense—the unrebated acquisition cost of insulin (list price) plus dispensing fee negotiated with pharmacy networks. She noted that interim co-lead counsel’s longtime work on behalf of health insurers, union plans and other private/public payer clients—including representing the Prescription Access Litigation project on drug pricing and rebating issues—now precludes those attorneys from making litigation decisions related to PBM/insurer defendants. In response to the filing of Boss’s motion for reconsideration, pro-insurer plaintiff’s counsel launched a brutal seven-month long warfare against Boss and T1DF. The Court finally put an end to counsel’ campaign of procedural harassment and ad hominem defamation on November 6. Without any warning and without entering into detailed explanation, Judge Martinotti granted Boss’s motion for reconsideration of the consolidation order during the November 6 Case Management Conference. He agreed to unconsolidate her case from the manufacturer-track litigation, and thus reestablish Boss v. CVS Health Corporation as an independent case. The status of the Minnesota lawsuit and the timing of the Court’s ruling on Defendants’ pending motion to dismissed were left unaddressed. During the November 6 Case Management Conference and separately in court filings and a letter to Minnesota’s Deputy Attorney General James Canaday, Boss noted that the State of Minnesota, as a payer and regulator of health insurance carriers, is similarly conflicted in relation to the patients’ injury. States have condoned benefit designs that base cost sharing on gross claims expense or list prices; they also derive financial benefits from a similar rebate capture scheme in Medicaid and other prescription drug purchasing programs (e.g. the Oregon Drug Prescription Program). States are thus co-conspirators and potential defendants in a patient action addressing rebate capture by public payers, private health insurers, employer/union plans and 340B covered entities. Furthermore, Minnesota’s attorney general also represents the citizens of Minnesota who, as an uninjured majority, may be benefiting from the discriminatory breaches of insurance laws perpetrated against a private class of protected individuals with specific chronic medical conditions. Contrary to the Prescription Access Litigation lawsuits filed by Hagens Berman in the early 2000s, public and private classes are now adverse. Minnesota’s copycat lawsuit filed in support of Hagens Berman’s manufacturer-only complaint should thus not be consolidated with any patient complaint. In addition to challenging the consolidation order, Boss informed the Court that Minnesota’s Attorney General appears to have breached several section of Minnesota Rules of Professional Conduct in addition to insurance laws. Minnesota’s Attorney General failed to recognize in the State’s complaint that overcharging in insurance plans is a discretionary choice made by insurance carriers and health plans but also reviewed and approved by the state’s insurance commissioner. The Attorney General hence misleads Minnesota’s insurance-buying public regarding health insurance benefit design and the parties directly responsible for their injuries—i.e. inflated insulin prices at the pharmacy point of sale. Coinsurance overcharging may also amount to the levying of a condition-specific premium against people who need insulin to live, in breach of federal statutes—Minnesota misleading complaint may further engage the personal responsibilities of attorneys beyond mere ethical grounds. The Minnesota lawsuit can’t be consolidated with the patient litigation; it should instead be investigated and attorneys with the Minnesota Attorney General’s office, including Attorney General Lori Swanson, referred to Minnesota’s State Board of Professional Responsibility for possible disciplinary action.